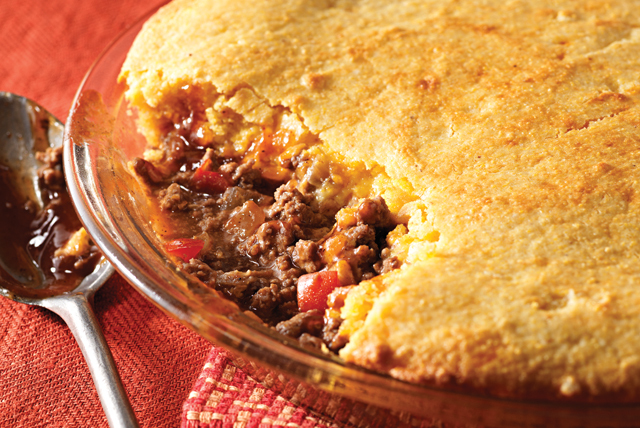 Meet your family's new favorite meat pie—made with ground beef, cheddar and BBQ sauce and baked until the cornbread topping turns golden brown. Heat oil in large skillet on medium-high heat. Add peppers and onions; cook and stir 5 min. Add meat; mix well. Cook 10 min. or until browned, stirring occasionally; drain. Stir in barbecue sauce; simmer on medium-low heat 10 min., stirring occasionally. Spoon into 9-inch pie plate; sprinkle with cheese. Prepare muffin batter as directed on package; spoon over cheese, completely covering cheese layer.